Face it, even though we talk about social media being about interacting with individuals, many companies have turned it into a channel for dumping information and broadcasting their messaging. What happened to the love? What happened to the engagement? Wasn’t that what was supposed to be so great about social media in the first place—the ability for companies to connect on a personal level? Despite the many companies out there who do not get this concept, there are many more who are committed to engaging with their followers in order to make social media a successful part of their inbound marketing program. The problem, however, is that with all the chatter in the social world, these companies miss tons of opportunities to engage in meaningful and personal ways. 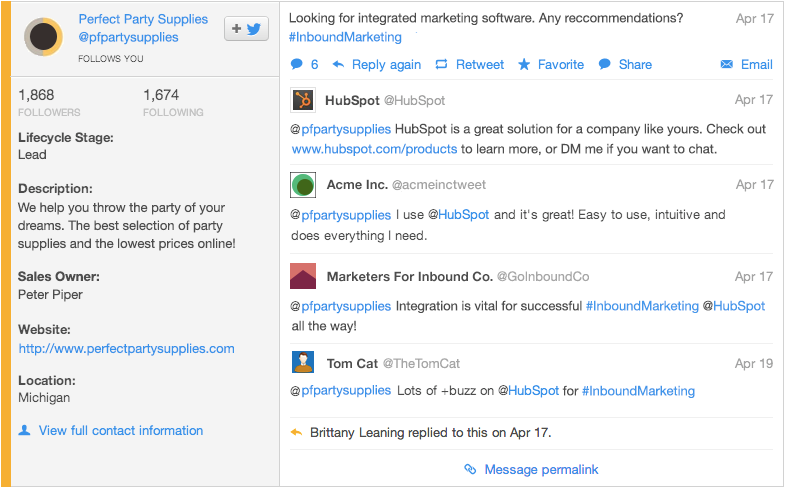 Enter HubSpot’s Social Inbox, a new app that merges your contact database of leads, opportunities, and customers with social interactions. The functionality of Social Inbox, which is set to roll out in June, is such that it allows companies to use the tool in various ways. For marketers, it not only helps in filtering out the noise, but it also provides information from social interactions that marketers can use to create highly targeted, personal messaging. Likewise, sales teams can monitor topics and conversations for opportunities to engage potential clients, or if an opportunity mentions a product or competitor, a sales manager can notify a rep so he or she can respond to that mention. Finally, for customer service departments, should a current client mention a need for help, a department rep would receive an immediate alert for them to jump into action and even conduct follow up engagements later on. Best of all, these interactions can happen in real time meaning the potential for no more missed opportunities! Does Social Inbox allow for better monitoring of keywords and twitter lists? Yes. Can you monitor your smart lists, like viewing only your qualified leads on Twitter? Yes you can. 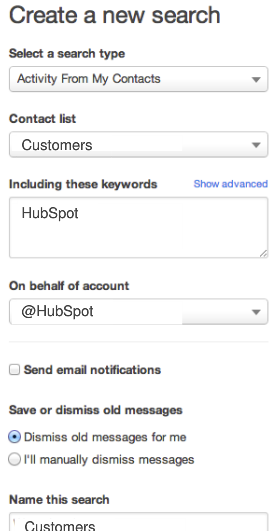 What about email alerts for when a lead, customer or other targeted contact mentions a certain keyword or a competitor? Absolutely. Is there a "Contact match" search feature to help you find the Twitter handles of more contacts? There is. Is it possible to assign or forward a tweet for response, and also see a history of responses? You bet. How about seeing the lifecycle stage and Salesforce owner of each social contact, with an option to click through and see the full profile. You can do this. Will you be able to do social media monitoring and publishing in the iPhone and Android App? You most certainly will. 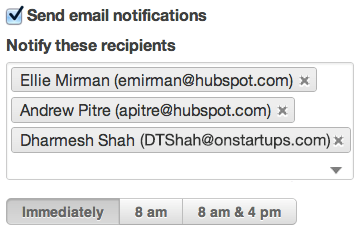 Currently Social Inbox is in beta, but HubSpot users who would like to try it out early can request access. Expect to hear more about this app once it hits the streets. This is a phenominal tool for companies to capitalize on putting the “social” back into social media.